Over 80 skaters from across the country have set created a new world record by skating continuously for 30 hours at the Belgaum-based Shiv Ganga Roller Skating Club. The skaters were flagged of at 11.25am on Sunday, the previous record for non-stop speed skating was in the name of Singapore Roller sports which they had done for 24 hours 14mins and 3 secs. 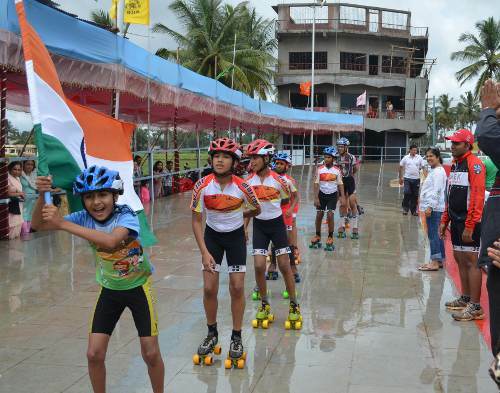 Chief of the Indian inline hockey team A D Sharma declared that these 80 skaters have broken the previous record. The skaters will skate till they reach 30 hours by 5.30pm setting a new record. Amidst the rains the skaters never showed any fatigue and skated all the time. Skaters from Punjab, Haryana, Chandigarh, Madhya Pradesh, Delhi, Rajasthan and Karnataka are participating. The officials from the World records academy and Limca book were also present at the event. Hey Paras great going keep skating!! congrats to all 80 skaters and mr A.D. Sharma, Amit sir , Vishal sir and all.